Thank you all so much for the lovely feedback on my Firefly socks in my last post – it is always so reassuring to have knitter-geek solidarity. It’s been a sock-a-riffic summer so far, and still with a bit more summer time to go! Another one of my ongoing projects this summer has been to spend time thinking about colour. I’m planning some colour-work designs in the fall and winter ahead, and in addition to sharpening my fair isle skills have been pondering colour theory and ways to practice colour knowledge in a compatible fashion with knitting. As much as has been written on colour theory, most of it assumes your medium is something mix-able, like paint or pastels, and I’ve been thinking about how to work through various ideas and colour brainstorming in yarn form. It’s also been neat to think through more ways of teaching this kind of thing, should future such opportunities come up. One suggestion I got from another instructor at the Haliburton Arts School in July (herself a painter) was to go and get the full 96 pack of Crayola crayons – it has a wider variety of hues than your average box of pencil crayons, and at a much friendlier price than most formal art supplies. It makes for easy graphing or colour-testing to check out colour combinations, when you want options for, say, magenta and periwinkle instead of just pink and blue. And the boxes still come with sharpeners inside! Ah, childhood memories. I do love that they wrap the crayons with the spectrum in mind – you can tell at a glance which colours belong to the blues or the violets, right when you’ve picked them up. I also find it interesting that the number of reds and violets, as well as blues and greens, far out-number the other shades. I suppose these must be the shades that kids reach for most often? But then, there is still the question of the yarns themselves. Inspired by a photo circulating on Pinterest which displayed embroidery floss on clothes-pin bobbins, I decided to create my own yarn “paintbox” with my colour-work yarn (here, Knit Picks Palette). I have so many colours to choose from if I were to start making selections for a design that it gets unwieldy to pull out all the yarn at once (those two big tubs are starting to get heavy…and overstuffed…oh yes, let’s definitely get some of that yarn into garment form! ), but this way I can have them all in a box at a glance, and sort all the shades according to their hue. It is the awesomest. If I want to look at, say, all the blue-greens, there they are! I think pretty soon my (smaller) Cascade 220 stash is going to get the same treatment. Ah, colour. So much fun, so little time. What a great idea! I don’t think I’ll ever get tired of seeing a ton of color in one place. those clothespin bobbins are amazing! it makes me think artistic things (and I just don’t do that often! Oooh! I love your colourwork yarn system! Looks amazing! 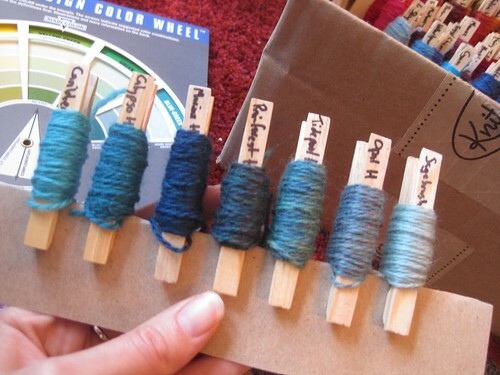 I love the clothespin idea and I have a bunch of palette too. What a great idea. Delurking to say that I’m very much looking forward to what you come up with. Absolutely love that idea, I haven’t done any color knitting myself, and I don’t have too much yarn to catalog, but it sure seems like now is the best time to start and your idea is brilliant. 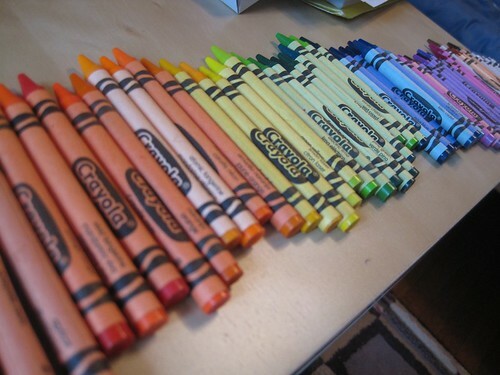 It makes me indescribably happy to see crayons all lined up by color like that. 🙂 I never did that as a kid — always left them in the box in the order they came in because I could find things that way. But that picture is….. pretty, and happy, and *hopeful* somehow. And really timely, given that school is going to be restarting in a few weeks. Love the yarn bobbin idea too (even if it came from someone else), and LOVE that you can clip them to a card for whatever reason. Genius. What a great idea! I can’t wait to see what you come up with! I look forward to your color work, too. It’s bound to be awesome! Love, love, love the crayons. 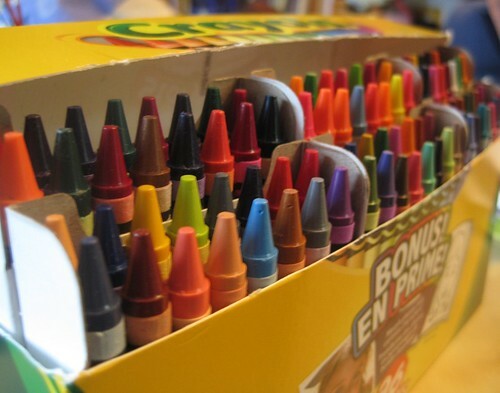 I used to get a box of 72 Crayola crayons (back then it was the biggest box) every year for Christmas. Like Sue, I love the smell and still have a box of the old, now retired colors. Remember “burnt umber”? 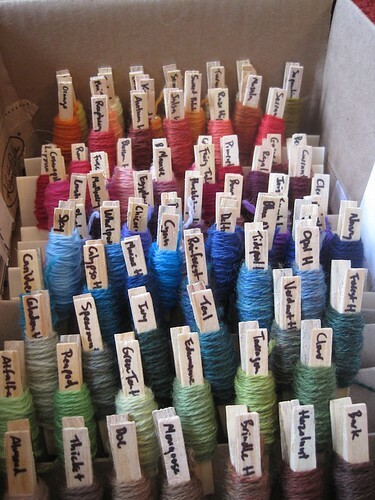 The only thing better than a new box of crayons is your “box of yarn.” Absolutely gorgeous! It looks amazing. I have a feeling that after this much digging into colour theories and thinking about fair isle we can expect quite a few colorful garment coming off of your needles this autumn. Great idea. Your point about things that can be mixed (or not) made me think of Georges Seurat and pointillism. One of his things was the science of colour (apparently) and he often worked with a limited palette relying on the ways that the eye reads 2 colours next to each other (especially in teeny tiny dots) for the mixing. I haven’t read a lot about it but I bet similar principles could be useful in knitting. Those wood pegs are a great idea. I can use them for my left over yarn & write the details on the peg as I often lose the labels. I have to get a box of the crayons as I love the colors. I love this idea. I’ve recently been itching to try and design a few patterns myself, and I have this idea for a colorwork cardigan… if I want to keep going down that road, then it’d be so helpful to have all those yarns laid out like that! Easy access. I love the color theory/crayon post. The concept can be used in decorating, drawing, and so many other areas of crafting. Great post and photos! Juh! Genius to use clothespins, and yes, I do remember burnt umber, with great fondness. I didn’t realize Crayola had branched out into >90 colors! It’s so wonderful. I never get organized because it doesn’t seem worth the trouble, but this is such an amazing idea, it seems worth doing. and who knows, perhaps it will leak out into my office, or even my (gasp!) home life. Just, wow. You’ve made me really, really want to go buy a box of crayons and a colouring book. Also, now I need crayons. So much fun and what a great idea!